Central's product design and development team constantly monitors industry trends and anticipates customers' requirements by developing more efficient and lower profile devices for ever-smaller and more sophisticated electronic devices. Check back frequently as Central's engineering team regularly updates this listing of recommended products for the latest demanding applications in the industry. 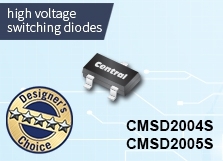 Designer's Choice: Central's CMSD2004S and CMSD2005S are dual in series silicon switching diodes in the SOT-323 package. These devices are designed for applications requiring high voltage capability. 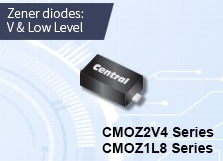 Central Semiconductor’s CMOZ2V4 series of Zener diodes (2.4V - 43V) is designed for applications requiring low leakage. When extremely low operating current is required, the low level CMOZ1L8 series (1.8V - 47V) is the ideal choice. 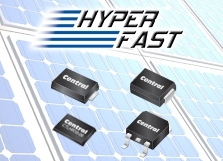 Designer's Choice: Central Semiconductor's CMJ series of silicon field effect current regulator diodes is designed for applications requiring a constant current over a wide voltage range. These devices are manufactured in the epoxy molded, low profile SOD-123FL case. Special selections of IP (regulator current) are available for critical applications. 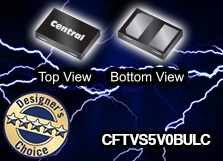 Designer's Choice: The CFTVS5V0BULC is designed to protect sensitive equipment connected to high speed data lines against ESD damage.